I’ve mentioned that the holidays are all about cookies in my family, and I wasn’t kidding. Here’s one last cookie recipe you can squeeze in before the holidays. They make a great gift! I can’t remember ever celebrating Christmas without these cookies. If you’ve ever had Thin Mints, you know exactly what they taste like. The surprising part is how easy they are to make. The holidays are always a chaotic mess of shopping, wrapping, baking, cooking, cleaning, entertaining… whew, I’m exhausted just typing that sentence. So why not make things a little easier on yourself? Forget about softening butter and shuffling endless batches of cookies in and out of the oven. If you have two hands, three ingredients and about an hour, you can make these seriously addictive cookies that will have your relatives inviting themselves to your house for the holidays year after year! I know at first crackers dipped in chocolate sounds gross, but I assure you they taste just like the real deal Thin Mints. 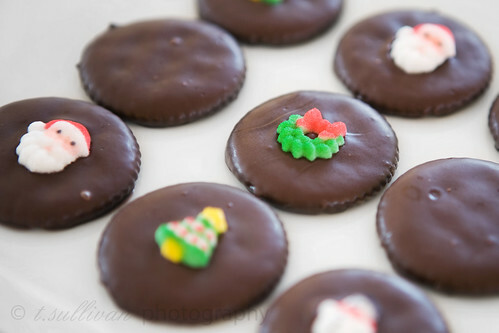 I’ve always used dark chocolate candy melts to make these, but I’m pretty sure any chocolate will work – the candy melts just save you the step of having to chop the chocolate before melting it. Cover a flat surface (counter-top or cookie sheet) with wax paper. Place the chocolate in a medium, heat-proof bowl. Set the bowl over a saucepan with about an inch water and heat the water to a simmer (not boil) slowly melting the chocolate. Stir frequently. Remove bowl from the heat when all but a few lumps of chocolate are melted. Continue stirring away from heat until melted smooth. Working quickly, dip crackers one at a time in the chocolate, coating both sides. Remove the cracker from the chocolate with a fork and tap gently on the side of the bowl to shake off any excess. Set on wax paper to harden. Repeat with remaining crackers until out of chocolate. Be careful not to overheat the chocolate. Melting it slowly and removing it from the heat with a few small lumps of chocolate left is the best way to avoid this. NEVER add water to chocolate. It will only cause the chocolate to seize. If you feel your chocolate is too thick, use something like Paramount Crystals for thinning. On that note, make sure you use oil-based extract for the flavoring to avoid ruining the chocolate! If the chocolate starts to harden while you’re working, warm it over the same pot of simmering water for a minute or two to loosen it up again. Using a fork to dip the cookies works well enough, but if you make them more than once, it’s worth it to get this Candy Dipping Set from Wilton. I think the two-tined fork is perfect for making these cookies. The cookies will harden at room temperature in an hour or two. If you need to speed the process along, place them on a wax-paper lined baking sheet and put them in the freezer until hard. I prefer leaving my cookies plain to make them look as much like Thin Mints as possible, but you can top them with all sorts of fun things! In the photo above I used these tiny Christmas Charm Sugar Toppers. In the past I’ve used crushed candy canes. You can also use sprinkles, colored sugar, cookie crumbs, or anything else you can think of. Add toppers before the cookies harden to make sure they stick. I love thin mints so I can’t wait to try this recipe out. I admit I am a little skeptical about the use of Ritz crackers but I trust your taste in food — I’ve used at least three other recipes here that are my new favorites!